1. If Assad’s fortunes decline and he becomes desperate to attack Israel to divert attention from his problems and/or to try to unify Syrians, does it really matter whether Israel has attacked recently? Isn’t Israel already an all-purpose bogeyman given the last 65 years? 2. I think we should be more careful about the context in which we talk about quiet borders. Yes, Israel’s border with Hezbollah has been quiet since 2006 when compared with before. Yes, the Israel-Syria line in the Golan has been quiet. But in the last decade, Israel attacked an Islamic Jihad camp in Syria, bombed Syria’s nuclear facility, and hit weapons 3x (so far) during the civil war. The authors also note “the Assad regime tried to create a crisis by pushing Palestinian refugees living in Syria to return to Israel to divert attention from the crackdown.” Is that quiet? Moreover, when one mode of attack gets quiet (e.g. fewer border skirmishes), others may heat up. Israel and Syria did not fight in the Golan in the 1980s but they both contributed to a violent mess in Lebanon next door. Hezbollah may not be launching missiles at Israel but it may have poked Israel via drones and allegedly organized an attack that killed Israelis in Bulgaria. Quiet in one aspect or area of the relationship may only be part of the full picture of relations. 3. The authors would like the United States, “to coordinate allied interventions so together they make it more likely that Bashar’s regime will fall and Syria will return to stability.” Does that have to be overt coordination or could it be done in private? The Syrian civil war has now really spilled over into Israel, if in small doses. On November 3, three Syrian tanks rolled into the demilitarized zone in the Golan Heights. And yesterday, a stray bullet from Syria struck an Israeli jeep on the Heights. This, after Syrian shells fell on the Heights in September. While one can’t predict with certainty, it’s highly unlikely this will spark a direct Israeli intervention and Syria, and from there a wider regional war. The argument that Israel would become involved is similar to the notion that Turkey will soon be drawn into Syria because of cross-border violence. That argument has been effectively disproved, and we can follow similar logics for explaining why Israel won’t, either. First, while Israel certainly preferred the Asad regime to maintain stability on the border—just as it preferred Hosni Mubarak in Egypt—and fears the uncertainty generated by the Syrian violence, its disastrous intervention in Lebanon in 1982 taught it about the pitfalls of trying to arrange the internal politics of its neighbors. Sending the IDF into Syria is the only way to stop all violence across the border, but doing so runs the risk of drawing Israel into Syrian politics by tipping the balance in the fighting. But anything less than an invasion, even if it’s limited, will look unnecessarily aggressive and petty. Second, any intervention in Syria would have no clear purpose. Asad isn’t looking for a fight with Israel, as he isn’t looking for one with Turkey. Nor does the Syrian opposition want the Israeli army fighting alongside it. Israel would have no military objective worth the price of being tied to the war, and no clear exit strategy. Indeed, as the jihadists in the opposition, already known for their resentment toward Israel, are increasingly well-armed, Israel would find itself facing a situation in which the local forces turn their attention to Israel, Hezbollah-like. Getting mired in a guerrilla war against Syrian opposition groups at a time when Israel is already facing uncertainty on the border with Egypt, the unresolved Iranian nuclear issue, the teetering of the Palestinian Authority, and a resurgent Hamas would be an unnecessary provocation at a time when Israel’s focus is needed on genuine threats. Third, that Iranian issue remains Israel’s primary focus. Military intervention in Syria would sap time, attention, and resources from the Iranian file. Fourth, Israel is in the midst of an election campaign. While that’s not a guarantee that the government wouldn’t engage in military action if it deemed it necessary, responding to a few inadvertent hits from the Syrian military hunting down the Syrian opposition doesn’t classify as “necessary.” It would also put Prime Minister Benjamin Netanyahu more on the defensive against his electoral rivals, some of whom are already hitting him on his belligerency toward Iran and his failure on the peace process. Netanyahu is risk-averse, and the balance sheet on intervening in Syria puts the disadvantages at far, far greater value than the advantages. All of the cross-border violence has been limited, and hasn’t reached over the Golan to hit the more densely-populated Northern Galilee. The primary purpose of holding on to the Golan has been for its strategic value: as a plateau overlooking northern Israel and into Syria, it acts as both a defensive barrier and a potential launching point. A few shells or bullets, or poorly-guided tanks, aren’t enough to change that calculation. It remains to be seen if Syrian regime forces will, accidentally or while fighting the rebels, engage in more serious violence. But even if it does, my guess is that Israel will continue to lodge official complaints with the United Nations and raise its alert levels, but no more. The Syrian violence simply doesn’t pose a serious enough threat to Israel for anything more. 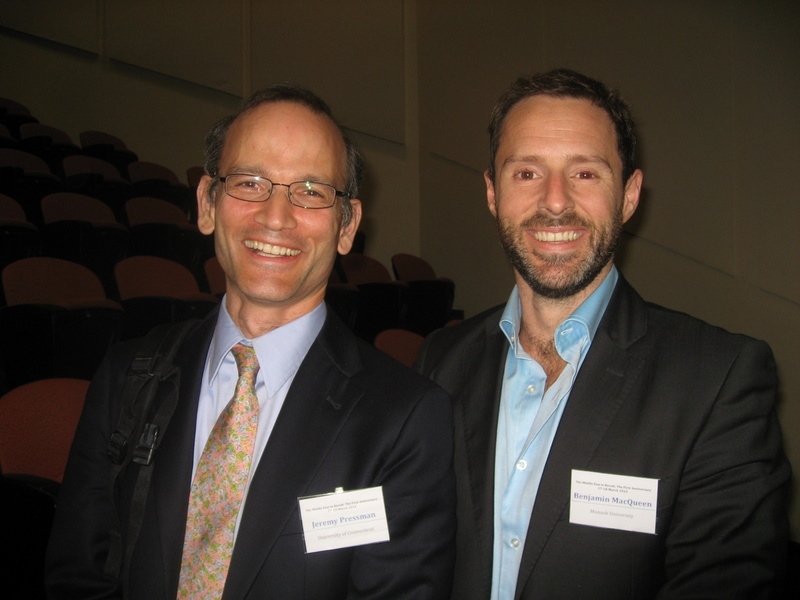 Prof. Benjamin MacQueen (Monash) and Prof. Jeremy Pressman (UConn), both bloggers here at Mideast Matrix, presented papers at a conference held at the University of Melbourne, “The Middle East in Revolt: the First Anniversary.” MacQueen’s paper dealt with the (democratic) transitions literature and its potential application to Egypt and Lebanon. Pressman talked about the Obama administration’s response to the Arab uprisings.